Tiger Production www.tigerdio.com/ is having a moving sale, and I got a couple of figures from the Minuteman Model range at a great price. One of them was a Sacagawea bust that I have started on. The bust came in two pieces with the knife being separate. There were a few mold-lines but nothing too bad. 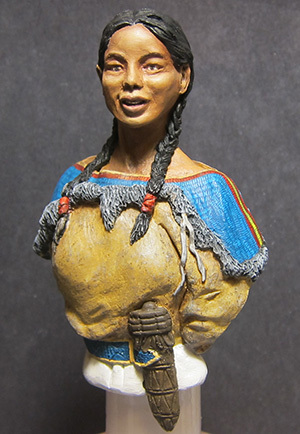 The finish in the face wasn’t great, especially since Sacagawea was supposed to have been a teenager, but some light sanding made it better. I also rounded off her jawline and protruding chin a little, as they were very sharp. There was a slight mis-cast on the side of her nose that I fixed, as well using some putty around the knife to make it fit better. Overall I’d say it a good quality bust, though not the best. It’s great value for the price though. Here it is before and after priming, and with the painting started. A bit more finished with more of the clothing painted. The eyes definitely require some work… I think the irises might be a little bit too small, and she looks a bit crooked-eyed. I still need to finish the hair, belt and knife.